Dr Kiran C Patel is a well-known cardiologist and philanthropist in Tampa, Florida, who has built a business empire of health insurance and managed healthcare companies worth billions of dollars. 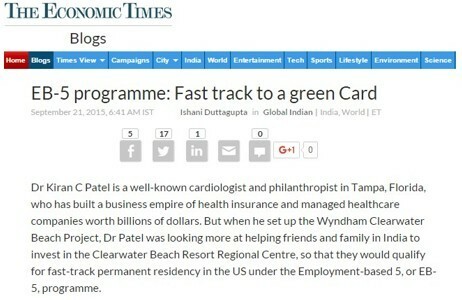 But when he set up the Wyndham Clearwater Beach Project, Dr Patel was looking more at helping friends and family in India to invest in the Clearwater Beach Resort Regional Centre, so that they would qualify for fast-track permanent residency in the US under the Employment-based 5, or EB-5, programme. Dr Patel has himself invested $50 million as the developer of this project. “The project is already around 30 per cent complete and should be ready by January 2017. For EB-5 investors from India, it provides a safe project to put their money, which is often a concern for applicants of EB-5,” Dr Patel told ET.